Published October 7, 2016 By Anna T. This post may contain affiliate links. Regardless, I only recommend sites I've researched and/or used and trust. Courthouse research is another very flexible job you can do outside of the home mostly on your own time. While the work is nothing alike, I do sort of throw this kind of work into the same category as merchandising when it comes to working from home. This is because while the work isn't done in the home, you are mostly free to pick your own hours, and this makes it an attractive option. While I have done courthouse research for the company I used to work for, I have never done it for any place that specialized in just that. So, I've had to do a little digging to come up with this info for you. Basically, you visit courthouses in your area or surrounding areas and collect information from the public records there to give to whatever research company you are working for. The companies need different info for different reasons, so you won't always be looking for the same types of records. You don't necessarily need any college degree or special skills to do courthouse research, and there are many companies that will hire you whether you've ever done this type of work or not. If you are a beginner, they will help you learn to get started. However, there are some companies that may prefer to hire experienced researchers. How much does courthouse research pay? 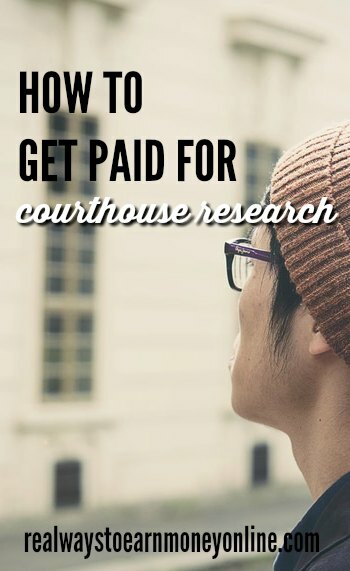 Courthouse research pay varies greatly depending on who you do it for. Some people with lots of experience and speed are able to make up to $20 or more per hour while beginners might make around $7 to $9 an hour. If you've been researching work at home jobs in search of a full-time income, this probably won't give you that. Instead, it's best to consider this supplemental income since you may not know when work is available to do. Most courthouse research companies hire you as an independent contractor. How do you search for the records? Again this may depend on the courthouse. Some courthouses keep records in large, heavy books while others may have everything on computer. And then some courthouses may have their records in both places. There is nothing to keep you from searching through the records since it is public information. If you don't know where they are, you should of course ask someone at the courthouse. After you've done the work for a while, you'll know where to go and things won't seem so intimidating. You will also likely build up your searching speed as you discover the most efficient ways to search for records. Building up speed could increase your hourly pay depending on who you are working for. Do you visit different courthouses? Many people visit courthouses in their county but also in surrounding counties, and doing this may keep you in steady work to do. However, if you are traveling a good distance away from your home, you need to keep in mind that you are probably spending additional money on gas. This could make a trip to a neighboring courthouse not worthwhile if it is fairly far away and you're not getting reimbursed for gas mileage. Something else you can do if you need more work to keep you busy is apply with several different companies that hire for court research. Can you bring your kids to the courthouse while you do your research? Technically you can, but you have to realize that that may not be the best idea. Doing courthouse research isn't just a quick trip in and out of the building — it's work. You may end up being there, digging through files, for several hours. Are your kids going to be able to entertain themselves for that long? Are the people working at the courthouse going to be OK if your children become extremely bored and start disturbing the peace there as a result? Likely not. So it may be best to do your research on a day when you know you will be kid-free. Deed Collector – You're hired as an independent contractor. The faster you type, the more you earn. Most of their researchers make $15-$20/hour. Information Technologies – They are in search of court researchers & data collectors across the nation. Independent Contractor position. Pay based on number of records collected. IT Boss Research – Regulary looking for independent contractors to become court researchers for their clients. They claim most researchers earn between $10 and $25 hourly. Jelly Bean Services – Read Review – Must be dependable, accountable, & available at least 5-10 hours per week for court research. Wolfgang Research – Free training. Pay per valid collected record. Tax Sale Lists – They have a few 1099 part-time research positions available. Do you have experience in court research or more companies to add? If so, please share what you know below! Want To Get Out of the House to Earn An Income, But Don't Think Court Research Is Right For You? Direct Sales – think Avon or Chloe + Isabel. UberEats – drive on your own time delivering food orders. Mystery Shopping – get paid to evaluate retail store in your area. This post originally published in September of 2011. Updated and re-published for 2016. I just sent a query to One Legal, a litigation support service company operating out of Novato, CA. They seem to be a solid company doing a lot with electronic filing, etc. I emailed the HR manager to ask if they need people on the East Coast. I have a question. Are there electrical outlets at the courthouses, close to the work area, in which I can plug in my laptop to recharge it while I am working? I have a laptop but its battery life is only about 2 hours. Thank you in advance for answering my question. I’m not really sure Christine, I guess some probably do and some don’t. If I were you, I would contact some local courthouses to your area and explain that you might have to do some research there with your laptop and ask about that. Thank you so much for answering my question. I really appreciate it. Interesting. I just want to add a caveat. Just because a record is being kept by a public agency does not mean that the record is available for anyone to see or obtain. Rules vary from jurisdiction to jurisdiction and depend upon the type of record. I assume that the companies usually send their ICs to get information that is available to the public. I will add that bringing small children with you to do research in public agencies is not a good idea. Young children are not interested in your research and will quickly get bored and restless. Thank you, thank you, thank you for all your valuable research. I have learned so much from your site. But I must say that I fully agree on not taking the kids to the courthouse. You would think this would be automatically understood. I do understand that there are moms out there who must bring kids along, but I really don’t think bringing them to a courthouse would be proper. I am sure the kids would be bored and act up, and well, quite frankly, the other people at the courthouse shouldn’t have to put in that position. Most people only go to the courthouse when they have important business to tend to. Kids shouldn’t be a distraction to others. I had never heard of Probate or Background Profiles. Courthouse research generally appeals to someone who wants to work from a home office, but still get out of the house from time to time. Because the schedule is flexible, it’s a great job for stay-at-home moms with kids in school. I am so happy to see this article! I’ve been looking for this type of employment. Have the reputations of these companies been checked out? I’m always nervous about what may be too good to be true. Of the ones listed, Wolfgang, Jellybean, and Sunlark seem to be the most reputable although I believe all the companies are legit. I could not find as much info on the others, but I got their names from places online that I consider reputable and they seem to all check out OK. I am trying to add to the list as I find more.